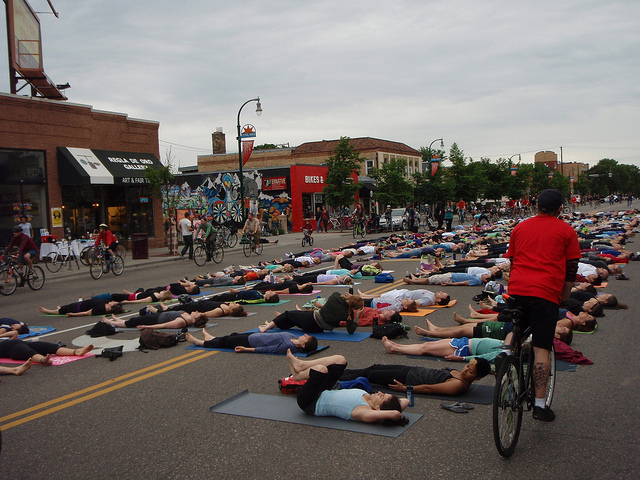 Minneapolis, Minn. held its first Open Streets day last weekend, when cyclists, pedestrians and even yoga practitioners could enjoy the streets without cars. Photo by Snak Shak. The Los Angeles County Economic Development Corporation (LAEDC) and Environmental Defense Fund (EDF) released a new transportation plan for Los Angeles to improve transportation access and mobility, make housing and transportation more affordable, and improve air quality and reduce greenhouse gas emissions. The Pimpri Chinchwad Municipal Corporation (PCMC) in Pune, India will soon appoint consultants to monitor and evaluate the impact of the city’s proposed bus rapid transit (BRT) project. The Delhi Integrated Multi-Modal Transit System (DIMTS) is developing an Intelligent Transport System (ITS) for the city’s bus rapid transit corridors. The new technology will include intelligent signaling, a video surveillance system, GPS-powered vehicle location, passenger information systems and automatic fare collection. Bombardier Transportation won the contract to upgrade signaling for four sub-surface lines of the London Underground. The innovative communication-based train control is similar to the technology running on the Metro de Madrid in Spain. Minneapolis, Minn. held its first “Open Streets” initiative last weekend, where streets were closed to cars to allow people to walk, bike, run and skate for a day. The event was modeled after the weekly Ciclovia in Bogota, Colombia. Meanwhile, on the East Coast, hundreds of Brooklynites in New York City enjoyed a car-free Bedford Avenue at the fourth annual Williamsburg Walks. The event will continue this Saturday, with events sponsored by the New York City Department of Transportation, which will be giving away bike helmets, and Bike NY, which will be teaching children how to ride bicycles. Taipei City’s Urban Design Review Committee approved a project to build the Taipei Dome, which includes a shopping mall, movie theater, hotel and office space, despite protests from some environmentalists and local residents, who said the massive commercial complex will have a negative impact on traffic flow and the environment. City officials in Toronto, Canada will consider a proposal next week to name public spaces after corporate sponsors to generate revenue for the city. Existing examples in the city include Scotiabank Nuit Blanche, the Saturn Playground and the Franklin Children’s Garden. European rail company Eurostar announced progress made towards it “Tread Lightly” environmental sustainability initiative. The company has cut emissions per traveler by 25 percent in 2009 and has now set a new target of 35 percent by 2012. The European Union’s 27 transport ministers met in Luxembourg this week and agreed that the European Commission’s proposed objective to cut transport emissions by 60 percent by 2050 compared to 1990 levels was too difficult to attain. Healthy Communities Coordinator Clint Randall explained to the Philadelphia City Planning Commission how comprehensive urban planning that includes high-quality facilities and access to walking, biking and public transportation can improve public health. The city of Philadelphia is known as a leader in recognizing sustainable urban development as a way to combat chronic illnesses such as diabetes, obesity, and high blood pressure. This month, the Texas Department of Transportation (TxDOT) will be airing a mini telenovelas series to educate the Hispanic community about the consequences of drinking and driving. The three, two-minute episodes will be available online at https://www.youtube.com/txdotpio. Businesses, NGOs and local authorities in the United Kingdom, France and Belgium are encouraged to submit projects for consideration for the Eurostar Ashden Award for Sustainable Travel, which includes a £20,000 cash prize and awareness-building activities for the winner. The American Public Transportation Association (APTA) and public transportation systems across the country celebrated the 6th Annual National Dump the Pump Day on June 16, a day to encourage people to ride public transportation (instead of driving) and save money. The Virginia Railway Express, a commuter rail system, won “honorable mention” from the Virginia Transit Association for its “security is no accident” marketing campaign to improve public transportation.